Quickly locate a fast food restaurant based on your current location. Have you ever walked out of a meeting, been in an unfamiliar place and needed to find some food quickly? This app will help. While many apps will find restaurants, this one gets straight to the point. 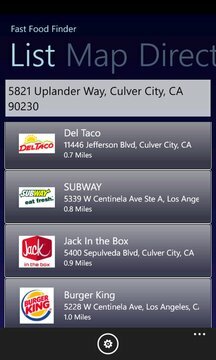 After starting the app, the closest fast food restaurants will be displayed. 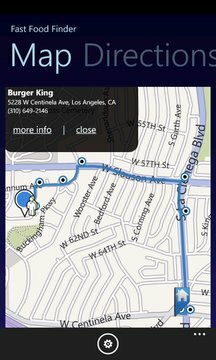 Once a restaurant is selected, it is displayed on a map with voice guided turn by turn directions available. It can also be configured to directly look for your favorites. This app requires use of your phone’s location services and is ad-supported.